Want to fly in a tranquil sunset in the South Pacific or stormy conditions in Toronto? 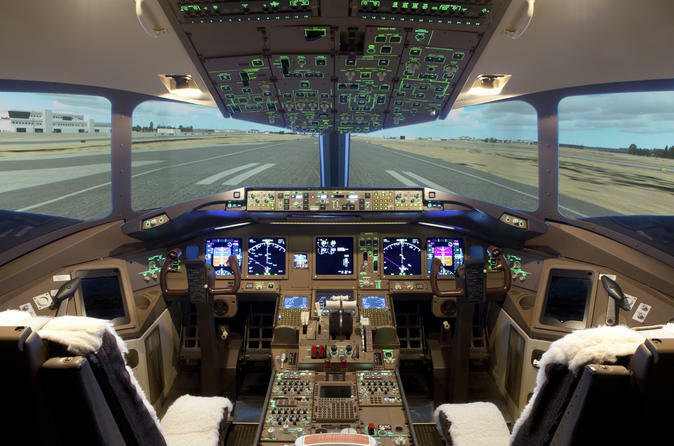 Take to the captain's seat of a real-life Boeing 777-200LR with an immersive and realistic 1-hour flight simulator experience. You'll fly the most meticulously detailed high performance aircraft created by real world aviation professionals, with components taken straight from a real Airlines 777. It doesn't get any more real! Featuring a fully-functional flight deck, take to the skies on a B 777 commercial replica for an authentic aviation experience. For starters, every switch, knob and button has the exact same function as it does in the real airplane - from the “fasten seat belt” sign to the most complex entries into the flight computers. Take your pick or customize your trip to the sky.